1. It did not build a good finish coat as quickly as I expected. 2. As I added coats the finish developed a very pronounced blush. By the time I had three coats on the box you could hardly read my wife’s name through the finish. I did some research and found that several companies make products that are supposed to solve the blush problem by dissolving the surface coat of lacquer with a slow drying solvent, this is supposed to release the trapped moisture which is the root cause of the problem. I was somewhat skeptical but decided to give it a shot. 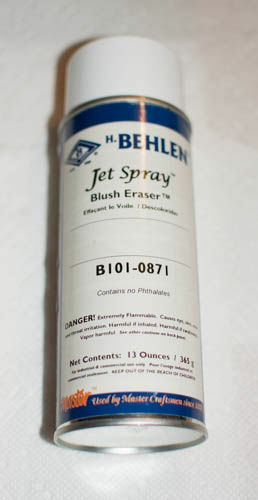 A bit of searching and I found shellac.net sold Behlen JetSpray Blush Eraser. I ordered a can. I just tried it today and it was amazing. One quick, light coat did the trick. The blush disappeared as I sprayed it on the box. Thirty minutes later the box was dry and blush free. I had order some Behlen Satin Top Coat Lacquer when I ordered the Blush Eraser. I gave the box two more coats using this product and was very impressed with the quality of the coating. The box is made from sycamore and oak. The recesses in the interior were drilled using forstner drill bits. The box shape was cut using a router and template since I do not have a band saw or scroll saw. Very beautiful. I am sure you wife loves it. Another heirloom! Herb, you have 521 favorites marked. You better go to the shop and not come back! If I did that I might finish more projects. Can’t have that, it’d ruin my status in The 98% Club… Can I help it if I have ADHD??? Thanks for the comments. Yes, Carol, my wife, did like it. Many, many thanks for the review. And speaking of favorites, I have added this to my favorites. Very, very nice heirloom box for the sweetie! Well done, I also have had good luck with Behlen products. I cheated. I used MS Word on my computer to format and print the text. The text was printed to plain paper on a laser jet printer. I used the option during the printing process to print the text in mirror image mode. I then used a transfer or shading tip on a wood burner to transfer the text to the wood. This was done BEFORE applying any finish. It works and I like how it turned out. If anyone wants it, I’ll send a pdf with the heart layout. This includes the locations and sizes of the holes for the jewelry pockets and for the magnets and screws that form the latch. If you’d like to receive a copy, send me a PM with your email address. BTW: good to know about the Behlen products. HerbC, I don’t know how you did it but it appears that the name floats above the wood! It has to be your finishing technique! OldNovice, thanks but I think most of what you’re perceiving is a photography artifact caused by lighting. The technique I used to transfer the lettering did result in a small amount of unintended shading in the background of the lettering and the last two coats of Behlen lacquer certainly helped a lot.